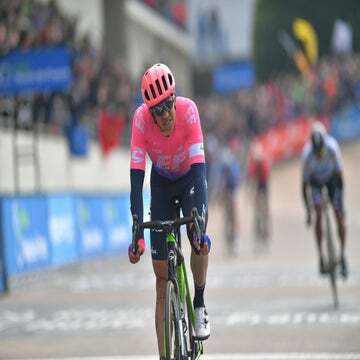 GENT, Belgium (VN) — There will be a moment Sunday when the elastic snaps and Paris-Roubaix dramatically transforms into a gripping battle between a select few. The rigors of the unending sectors of cobblestones, and the chaos caused by crashes, punctures, and mechanicals, will have taken their toll. But it’s more than the treacherous stones that make Paris-Roubaix one of cycling’s most enthralling events. There’s also the distance. At 257km, Sunday’s Roubaix is a hard-man’s race in every sense of the word. 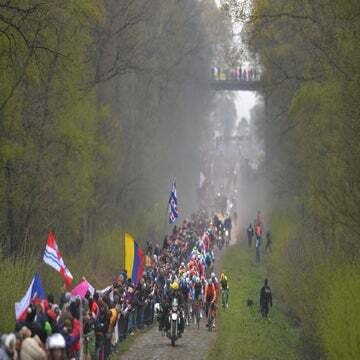 In fact, before that decisive moment when the race comes down to the few, there will be another moment: Usually around the Carrefour de l’Arbre, Roubaix reaches another breaking point. Deep in that final hour is when Roubaix’s magical moments unfold on cycling’s most punishing canvas. The strong distance the weak. On Sunday, there will be scores of riders who believe they can go that distance to win Paris-Roubaix. The reality is that barely a dozen of them have the engine to endure the monument distance and still have the legs to win after six hours of racing. Cycling’s five monuments — Milano-Sanremo, Tour of Flanders, Paris-Roubaix, Liège-Bastogne-Liège, and Il Lombardia — are cycling’s longest, oldest, and most prestigious races. All stretch to around 250km and last about six hours. The only other race that packs such heft is the road world cycling championships. It’s the longer distance coupled with the all-in, nothing-to-lose mentality that sets the monuments apart from any of the other races on the international calendar. If a rider cannot go the distance of the monuments, they have no chance at victory. Sunday’s Roubaix boasts international renown for its rough cobblestones, but all the monuments have the longer distances in common. Lombardia might be shorter (last year’s edition was 241km), but it features more climbing. 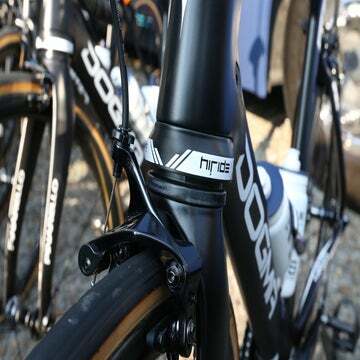 Liège is just under 260km, while Flanders is just over 270km. Even at a race as relatively “easy” as Milano-Sanremo, pros will say they feel the sting of nearly 300km of racing in their legs when they hit the Poggio and again when they launch a finishing sprint down the Via Roma. The extended length of the monuments creates a natural selection within the peloton that is unseen in other races. It’s the cycling equivalent of hitting the wall in a marathon, or to mountain climbing’s “death zone,” but without the accompanying dangers. It’s a distance that creates a clear separation within the peloton. “If you have 30 riders who can win a race of 200km, and you compare that to a race of monument distance of 260km, it is just a handful of riders,” said ex-pro Erik Zabel, now performance director at Katusha-Alpecin. Certain riders thrive on the pain and distance of the monuments. CCC Team’s Greg Van Avermaet knows his chances of victory vastly improve with each passing kilometer. A hard race jettisons faster riders who are marking wheels and saving themselves for a sprint. Mat Hayman, winner of the 2016 edition of Roubaix, said the longer monuments generally tend to favor veteran riders. Younger cyclists can win, of course, but he said the capacity to put out the power to race six hours is built slowly over time. Hayman, who won Roubaix at 37, says that’s why many riders are still capable of winning Roubaix relatively late in their careers. Four-time Milano-Sanremo winner Zabel has an interesting take on the monuments. He said recent trends in training and preparation have pushed toward high-intensity efforts to produce bigger power for accelerations on climbs and sprints. Zabel is a firm believer that the old-school style of training, loaded with base miles, still has its place in modern cycling, especially for riders who want to shine in the northern classics. As the peloton continues to modernize, physiologists have incorporated training techniques from other aspects of cycling to help prepare riders for the classics. Team Sky was among the first to put a renewed emphasis on altitude training camps a decade ago, bringing its classics riders to such places as the Teide volcano on the Canary Islands. Though Sky has yet to win Flanders or Roubaix, other teams have embraced some of those same training methods. Bora-Hansgrohe’s Peter Sagan, already a winner of both Flanders and Roubaix, has recently incorporated altitude training in Spain’s Sierra Nevada to his regimen to prepare for the spring classics. Anything that helps endure a monument is seen as a plus. There has been some suggestion that race distances should be reduced, especially in stage racing, based on the argument that a race is more exciting if it’s all packed into three or four hours of intense effort. What might work in the Vuelta a España won’t fly in Belgium. So far, the monuments are defying that trend and sticking firmly to their long-distance roots. The longer the better for the old-school cobble-bashers in the bunch. If Kristoff can be there in the final hour Sunday, it’s likely he won’t have much company. The monument distance always takes its toll.